Chill out with the fascinating history behind ice cream, the first in a fact-tastic Level 3 Ready-to-Read nonfiction series about the history of fun stuff! Did you know that immigrants to Ellis Island were served ice cream as part of their first meal in America? Or that George Washington spent more than $200 on ice cream during the summer of 1790? 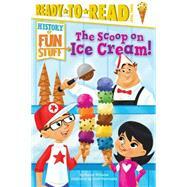 Learn all about the cool history of everyone’s favorite frozen treat in this fun, fact-filled Level 3 reader. A special section at the back of the book includes relevant info on subjects like geography and science, and there’s even a fun quiz so you can test yourself to see what you’ve learned!